The LGV Med route became available at the Train-Sim.com file library in file lgvmed.zip (19.9Mb) at the end of July. With the download file size being feasible across webTrainSim's feeble dialup connection, there was little hesitation to give it a try. Comments on the Train-sim message board seemed to support the idea. After installation, starting up MSTS and taking the first drive, webTrainSim knew he'd made the right decision. The webTrainSim roundhouse already had Chris Longhurst's Eurostar which had some of its cobwebs removed now and then on NEC. The LGV Med was just the route on which to let the Eurostar show its potential - with a few tweaks (see below). For those of you reading this and wondering why all the fuss, then visit LGV Med's author's site at perso.wanadoo.fr/lucweb/lgvmed/eng/ for screenshots, route description, FAQs and information about the TGV signalling system. Installation is straight forward, except the batch file may not create the route's Sound sub-folder, as noted in the readme. The consists for the included activities weren't in webTrainSim's download zip but that's no problem - we'll fix that little problem after installing the Eurostar. 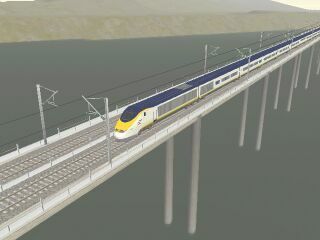 Follow the links at Chris Longhurst's site, www.christrains.com, to download his Eurostar, eurostar0.4beta_setup.zip (1.08Mb). 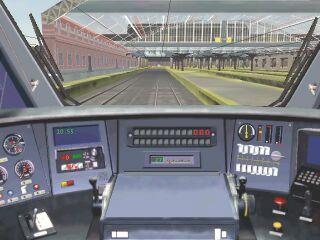 The MSTS Netherlands site, for example, has the Eurostar on page 2 of the downloads section. Although he created this trainset in the early days of MSTS, Chris' graphics skills have produced a worthy MSTS model. The zip contains a setup program so extract this to your Install sub-folder and run it. Now you need a suitable cab. You'll have read that the TGV rail system has its own signalling system - obviously required by the 300kmh top speed of the trains. 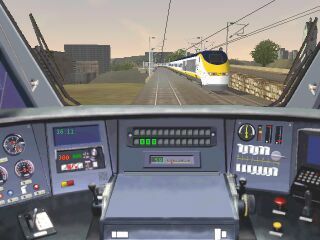 So now head to the the Train-Sim.com file library to download Kenji Kimura's version 2 Eurostar cab, eurocab2.zip (2.05Mb, 11-Jun-02), which features the latest TGV in-cab signalling system, TVM430. webTrainSim has some time ago changed his Eurostar installation so he can't recall whether or not there's a Cabview folder already created for the Eurostar. If not, create one. If there is an Acela CVF cabview file in this folder, delete it. To put the Eurocab files into the Eurostar's cabview folder, use the drag and drop method: open eurocab2.zip in a minimised WinZip window and open Explorer at Eurostar\Cabview. Select the files in WinZip and drag them onto the Explorer window to extract them. While you've got Explorer open, delete any Sound sub-folder under Eurostar - we'll alias to the Acela sounds to save disk space in the Eurostar ENG file in a minute. Before leaving the Train-sim.com file library, download and install the enhanced electric train sounds by Joseph Realmuto, elecsnds.zip. These sounds give you brake rumble and brake squeal, the former being particularly important when slowing the Eurostar - so much is happening so quickly, you can hear if you've got some brake applicaion. A more exciting - and noisy - option is to upgrade your Eurostar locos with Belphegor's TGV sounds: ElecAsync.zip (633kb) from his site at http://belph80001.free.fr/Sound_section/Sons.html. After running his Eurostar with these sounds, webTrainSim would advise these sounds are a "must-have". We'll be running the European FR trainset which is an 18-passenger car consist, headed and tailed by power cars. This trainset weighs 810 tonnes and has 12200kW power at the rail under the 25kV catenary system. The TGVWeb site has some technical specifications, as well as other relevant information, including a description of how the TVM430 signalling system works. webTrainSim has run the default LGV Med activities and, allowing for some of the steep grades, has found the above parameters reasonably realistic. After just a couple of runs, he's been only 2 minutes late for Marseilles-Nimes. The individual mass values may not be correct but they give a total mass of 810 tonne for a Eurostar 18-car trainset, as per the specifications (819,000 kg fully laden). A further change to the Eurostar trainset to achieve more prototypical performance and behaviour is to convert the R1 car from a WAGon to an ENGine. The real Eurostar is powered by 12 electric motors, each of 1020kW (1370 hp), four each on the power cars, two on car R1 on the bogie closest to the power car and two on R18, the last car coupled to the trailing power car. So these are the steps to take to change car R1 from a carriage to a powered carriage and adjust the power value in the original and new ENGine files. Open Explorer and wend your way down the folder tree until you reach the Eurostar folder, Eurostar. Select eurostar.eng and make a copy of it (use the Copy and Paste commands on Explorer's toolbar is the simplest method to use). At this stage, do a Save and scroll back through eurostar_r1.eng until you find the Cabview line - select this line and delete it. If you want, you can also delete the Description ( ) and EngineOperatingProcedures ( ) sections. Save and exit WordPad. The final job is to use ConBuilder to edit your Eurostar consists so they use the new R1 powered carriage.